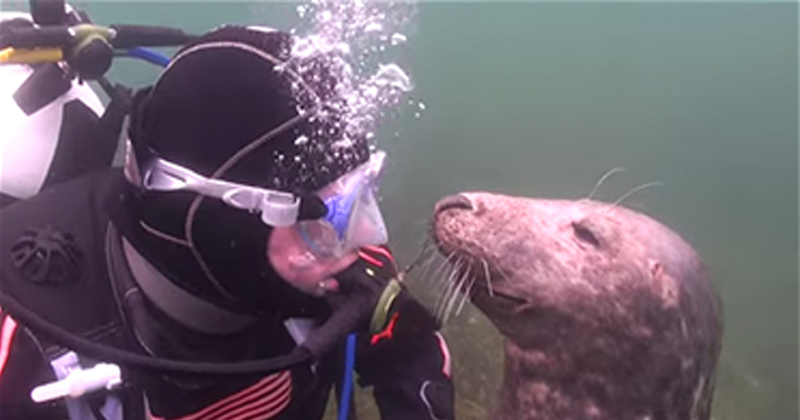 Diver Gary Grayson was in the waters off the Scilly Isles in the United Kingdom when he was suddenly joined by two grey seals. And the seals weren’t the least bit shy. One of them swam up to Grayson and touched its nose to his. Gary didn’t understand what the seal wanted. But when he stretched out his hand, the seal took hold of it and pulled it to its stomach. The seal simply wanted to cuddle—and be scratched on the belly! Please share this adorable video with your friends who love animals! At Newsner, we love animals and believe in treating them with utmost respect. Please like if you do, too.